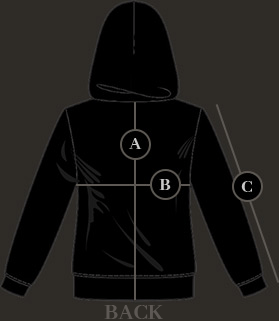 Warm, black zipped hoodie for ladies with Behemoth 'In Absentia Dei' design. Print on the front, back and both sleeves. Front pockets at the bottom. A Premium Quality hoodie, sewn from scratch in Poland from thick, warm cotton. My hoodie arrived today and couldn't be happier! I LOVE IT! Real good quality, warm, fits great, looks great, love ALL the details, from the prints to the tags. Everything is well made. The ONLY thing is that the lenght of the sleeves is a little bit short for me, but that's because my arms are really long (so I'm used to), fits great though. Thanks for the amazing work.